Steam Punkie has his first adventure. The book is now available for sale on Amazon. Steam Punkie has to deliver a parcel, but gets side-tracked after tinkering with his inventions and somehow ends up visiting an alien planet! Steampunk embraces Victorian industry and invention using all manner of fantasy or found objects like vacuum and watch parts. 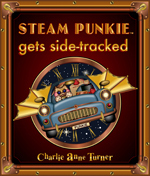 Steam Punkie is a master inventor (or so he thinks) and not all of his inventions work as he expects them to! This wonderfully illustrated children’s book has a lovely warm quality that makes it just that little bit different. Or click here to go to the Steam Punkie website.